A Far and Wild Safaris guide will collect you after your breakfast from your overnight accommodation in Durban or from the King Shaka International Airport and travel along the scenic Dolphin Coast and into rural Zululand, directly to the "big 5" Hluhluwe iMfolozi Park where we would spend two nights at Hilltop Camp. The accommodation here is in a brick under thatch chalet, each bedroom with its own private bathroom/wash-basin and toilet. Each chalet is also equipped with a fridge. Today we follow the lodge programme, which includes a morning game drive, breakfast, a guided walk (which is optional), lunch, afternoon tea followed by the evening game drive and dinner. As dawn breaks over the African bush, a gentle tap on your door will wake you to the delights of a new day. Your ranger will discuss what you hope to see that day over fragrant tea or coffee and morning biscuits or rusks. 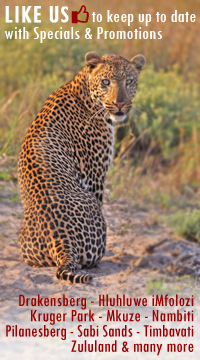 Phinda is renowned for its exceptional sightings of the elusive cheetah and the rare black rhino. There is also a number of resident lion prides and rangers will do their best to provide guests with a glimpse of all of these animals.